Countryside Community Church has begun an exciting new chapter in its ministerial life. The Congregation has bonded with a Jewish Synagogue and a Muslim Mosque, purchasing land together and sharing infrastructure to create a “Tri-Faith Campus” in which Congregations from all three Abrahamic faiths live together in unity. The Synagogue and Mosque are built; the Christian Church (Countryside Community) is under construction. Their original plans had only included moving of a small organ from their existing Church building; but a generous donor came forward – at the “eleventh hour” – with funding for a new organ. The Organ Chamber was already constructed (for the smaller old organ), and the architects’ visual ideas, while theologically interesting, were not compatible with practical considerations. 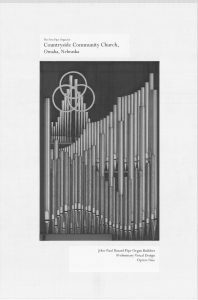 We needed to accomplish some very detailed, even if only preliminary, engineering to reconcile the available chamber space to what the Organist and Consultant, Alex Ritter, and we, wanted to achieve tonally. And, we had to do this very quickly to verify that the space allocated would be acceptable. This meant creating a speaking façade in which as many of the large metal pipes could be displayed, thereby freeing up chamber floor space. Additional challenges, such as two large steel beams and a cooking hood vent stack invading the chamber, further inhibited the engineering. Tonal Director Brian Davis, our Chief Engineer Charles Eames and his protégé Shane Rhoades all put their creative and practical abilities to the task. 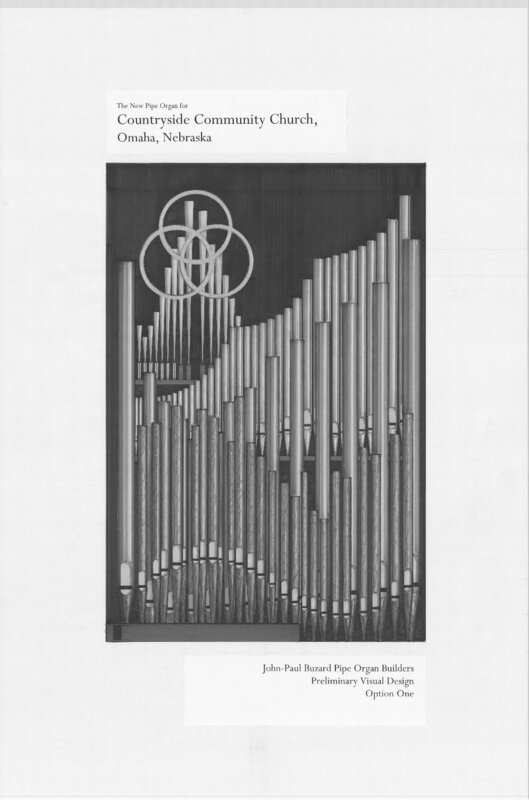 Artistic Director John-Paul Buzard communicated with Senior Pastor Eric Elnes to identify the theological tenets upon which the organ’s visual design was to be based. Brian initiated visual ideas on the computer and John-Paul collaborated to arrive at the final design. The architects produced a 3-D model so that everyone could view the instrument from any location in the Church. This exercise confirmed the design’s inherent integrity, balance and rhythm. The computer scan of the drawing which you see here didn’t “read” the metallic enamels I used in coloring the drawing, which showed the metal pipes appearing brighter and brighter at each ascending level of the façade. The background behind the pipes was colored a medium gray at the architects’ suggestion. When time comes, based on the success of the 3-D model, and according to our original suggestions, we will paint the interior of the chamber and the expression boxes and shutters behind the façade a dark brown. This will give the façade greater contrast and “pop” visually. The instrument of 25 stops has been designed to be expandable to 36 stops in the future. A three-manual console will be provided at the outset for the future expansion. Organist and Consultant Alex Ritter and Brian Davis collaborated in the tonal specification, customizing the rich Buzard tonal palette for Countryside’s individual tastes and desires. Members of the Church’s Organ Committee visited three of our organs in a whirlwind trip in which no fewer than five builders’ work was auditioned. After the Church formally selected us to be their builder, Music Director Dr. Amy Luckenbill shared the Committee members’ emotional reactions to the sound of our organs.